You probably have seen articles that talk about how influencers can charm the pants off of your customers, creating warm fuzzies that will result in a happily ever after relationship with your target audience. I am trying not to recreate that article. I want to talk about the specific reasons around how and why this can happen for your brand. Because you will need the right strategy and goals to make that happen. First, let’s go back to what brand awareness actually is. Most of us define brand awareness as how familiar consumers are with our company, goods, and services. To make consumers familiar with our company and products is no easy task. We must start by knowing who to talk to. Then understand how to reach as many of them as possible. That’s just the beginning. Next, we need to educate them and not many of us are in the mood to be educated if we haven’t asked to be. Not only that but just educating them once is rarely enough. We must do it enough times for a consumer to remember us but yet not get annoyed by us. And we can’t just walk away from trying to achieve brand awareness because that is the nagging voice in the back of your head demanding you switch breakfast cereal brands when you’re at the store. I’m sweating just thinking about all that work and I’m a marketer who does this for a living. 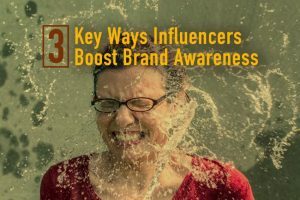 So how do influencers boost your brand awareness? We don’t want to hit consumers over the head with our messages but we do want to gently remind them what we do and how we can help so that by the time they get to the store or are ready to make a purchasing decision, they recall our product. Many of us have bought into the Rule of Seven. A consumer may need to hear about you 7 times before they decide to purchase your product. You may have your own rule. The point is, it has also been proven that this message is more readily received if it is from a trusted source. Many influencers engage a following that trusts what they have to say. For instance, if a fashion brand tells me 7 times that they have the best tops for summer, I stop paying attention. But if I see my favorite fashionista sharing summer fashion tips that include those tops, I’m listening again. The more your messaging aligns with what your customers are looking for, the more likely you will emerge in their search… but the rules have changed. If you want to be found online, not only do you need links to your website but those links must come from several different sources of quality content. As we experience an increasing tidal wave of content, search engines are finding ways to reward quality over quantity. Your content must be both relevant and organic. Avoid simply creating content and distributing the same pieces over and over, duplicate content doesn’t count. Your content must be highly engaging, well-written, and have depth. Who can help you create and distribute this type of content? Influencers. Find influencers that are considered authorities in your space to write and share compelling content around your brand. Don’t forget to engage with your influencers and their content and have them engage (organically!) with yours. What do marketers fear? That if we aren’t talking, our competitors are. But yet, we also know the importance of quality content. So without annoying the pants off of consumers, we have to find a way to ‘say more’ than our competitors. We can do this by learning what information our consumers are looking for (that is relevant to our industry) and how we can help answer their questions. For food brands, current trends show consumers are online hunting for summer recipes that are ‘easy’ ‘healthy’ and ‘fresh.’ If your product is deep fried beef wellingtons, maybe sit this one out and prep instead for recipes for cold winter days. But if this is your space, this is the perfect time to work with recipe creators on some delicious dishes that incorporate your products. This will not only increase awareness but trial as well. Let influencers do the talking for you. In closing, if you are thoughtful about who your true audience is, understand what content will help and not irritate this audience, and know the type of people they would want to receive that content from – you and your influencers will be a great match to spread the word about your brand. Happy brand awarenessing! Keely has helped brands and agencies develop and implement influencer marketing strategies over the last five years. She runs Influence Inspired, a company that develops custom influencer marketing solutions aimed to deliver unforgettable digital experiences that inspire the right audience at the right time for the best results. She is an alum of Northwestern University and began her career in sports marketing in Chicago. She currently lives in Denver and loves hiking, skiing, bacon, and really bad scary movies.